The eight best walking shoes for men for 2019 are listed in the navigation table below. You can immediately see the shoes I recommend and jump to any review you want to read using the link under the shoe you like. If you want to read more on picking the right shoe then you can skip past the reviews using the blue button immediately under this paragraph. If you are female and somehow landed on this page, I advise you to read my post about the best walking shoes for women. Make sure to read the rest of the article first, to learn more about your personal footshape and the fitting shoe types. Use the jump links in the table and in each review to move easily up and down the page to find what you are looking for. The Saucony Men's Grid Omni Walker has been around for a long time. The shoe is comfortable despite only having moderate cushioning which is a function of its design for overpronators. There are better shoes available but at higher price levels. For the money you get a good motion control shoe. The sole is designed to reduce pronotion with impact protection coming from a mix of three different materials to absorb shock and provide stability and comfort. It is a good stable shoe and if you want to learn more head over to my full review of the shoe. If you are an overpronator then you might also like our roundup of shoes made to help counter the effects of overpronation. The Gel Tech Walker Neo 4 is a walking shoe made for the road and for neutral gaited people through to mild overpronators. We have a full length review of the ASICS Gel Tech Walker Neo 4 here. The shoe comes with shock absorbing Gel to the heel area which helps reduce stress from the constant impact your heel suffers while walking. Additional gel to the forefoot area lessens shock and helps the toes at push off too. Made of high grade materials for durability and to ensure long lasting comfort which makes it worth the money. Rubber soles combined with the lightweight midsole, provide excellent grip and keep the shoe weight down. Breathable mesh uppers with stylish detailing to the sides helps the shoes look impressive and help keep your feet dry from any perspiration. An ortholite footliner provides good support for your arches and helps arrest overpronation along with the midsole technologies which ASICS call Duomax and Trusstic. The ASICS Gel Kayano 25 is a truly great shoe. Designed for long distance walking on roads and treadmills with the ultimate in comfort in mind. The ASICS ORTHOLYTE sock liner is able to help manage the sweat from your feet by wicking it away well. Cushioning is a big deal which the Kayano 25 provides in ample measure. Rearfoot and forefoot gel cushioning is supplemented by full midsole cushioning along the length of the shoe. The outsole comprises a high abrasion rubber compund to give you more durable wear. There are so many features in this shoe that I have covered in my full review. So if you are interested please check all the details there. Or just take my word and buy it if you overpronate or have a neutral gait. The New Balance 1865v1 is a good looking and capable shoe but the problem with it is that the shoe last is much too narrow. Unless you have narrow feet then you will need to buy a half size larger to try to get a fit. The shoe has good cushioning inside with reasonable support. If you need extra support then the insoles can be removed and custom orthotics installed. The issue with that is that you may find yourself cutting the custom insoles to get a good seating and limiting the available foot space inside the shoe.. The shoe is suitable for neutral and mild overpronation gaits with SBS technology that gives the shoe better stability and aids shock absorption. This is a good shoe if you can get the right size. We suggest you try one half size longer than usual and one size wider which is possible as the shoe has several width options. I urge you to check out my full review on this shoe. An excellent shoe for overpronators and neutrals as the New Balance 928v3 is a motion control shoe with rollbar technology. The rollbar technology ensures that the shoe has some resistance to the pronating roll between heel strike and midfoot loading. In this way overpronation is reduced and the foot encouraged to a more neutral alignment. To complement that, it is important that there is sufficient support under the arch to reduce the extent of arch collapse and again reduce the tendency to overpronate midstride. The orthotic insoles are removable but we suggest ordering a half size larger to accommodate your own orthotics as these tend to be thicker than the insoles supplied. The shoe last is not very wide for sizing but there are many width fittings to choose from. The shoes come in various widths with some models coming in narrow and super wide fitting widths. The shoe has a leather laced upper with plenty of room in the toe box. The lacing area provides a bit of lattitude for those with higher insteps. Overall these shoes are good for multiple uses and are smart enough for a casual work environment, classy enough for casual pleasure outings and comfortable enough for all day wear. If you want a comfortable shoe for walking or just to go to work in then these may be an excellent choice. You can read our full review on this shoe here. The Brooks Addiction Walker is a shoe that covers every corner. Excellent support for you if you overpronate or have a normal to flat arch and it is our top pick for regular walkers who overpronate. The excellent leather uppers have a classic look that makes them suitable to wear almost anywhere and the shoe is cushioned just about everywhere. Brooks have an insole with a patented BioMoGo cushioning which truly does adapt to your stride and weight to give you optimal cushioning through your stride as it absorbs the pressures from impact to push off. The progressive diagonal rollbar in the sole helps to counter the tendency for the foot to over rotate midstance and leave the foot better aligned for the push off. In this way your overpronation will be controlled. To top it off the soles are anti-slip to ensure you have the traction you need for any reasonable surface. WooWalkers endorses this shoe 100% and you can read our full review here. Saucony make a good range of quality shoes for walkers and runners even if not so prominent with their advertising. The Saucony Echelon 7 is an excellent shoe designed for flat footed underpronators. Flat footed supinators may not be the most obvious group of people given that supinators tend to have high arches rather than flat ones. But it is a group big enough for Saucony to target with this shoe. Of course, the shoe is also good for most normal arched people and for neutral gaits as the guidance technology aims to keep your natural stride and the support is equally beneficial for neutrals. The full length foam midsole has a cushioning layer on top to ensure more evenly distributed cushioning which you will well appreciate. The insole is thicker than the usual cheap thin insoles passed off in some expensive brands. It is removable too, so if you want to swap it out then your replacement won't be making the shoe much smaller because of its thickness. The shoe actually suits a wide range of foot types but not overpronators. The Echelon 7 has stronger rubber inserts to the high wear areas which are the same areas that need shock absorbing. This shoe is our pick of the bunch for most supinators and a good alternative for the more neutrally gaited. Do yourself a favour and watch the video - it explains much more than I have space to explain! Hoka One One predominantly make running shoes but this shoe is equally suited to walkers looking for super cushioning. The Bondi 6 is a lightweight shoe that still provides levels of comfort and cushioning that much heavier shoes provide. A clever choice of materials and design make it possible. The midsole is a dual density affair called PROFLY® which provides softer cushioning in the heel area and firmer in the toe area. This helps you push off more definatively. The Bondi 6 is not really for overpronators as the cushioning is so soft that your foot will not have much resistance to turning inside. For this reason I do not advise this shoe for overpronators - go for the Gel Kayano instead which will offer close levels of cushioning with the added stability you need. The Hoka One One Bondi 6 is designed with an Active Foot Frame system. The insole and midsole work in combination to allow your heel (predominantly) and rest of your foot to bed into the footbed rather than sit on top of it. This positions your foot firmer in place, restricting the amount of slippage and giving you a more comfortable experience. The low drop midsole design is contoured in what Hoka One One call the Meta Rocker system that helps your natural gait stay on track. The Bondi 6 matches anything and is a great shoe for basketball referees and those running on astro turf or in sports halls. There's pleanty of other colors available too. Why not check it out now? As your feet swell during walking choosing shoes at the end of the day is a good plan. You should also put on your walking socks beforehand. If you wear orthotics, be sure to buy shoes with removable insoles. The first point is to ensure that you are looking at shoes designed for walking and then choose a pair that are appropriate to the anatomy of your foot. To do this you need to identify your foot pronation and arch-type and choose the appropriate shoe design. The information below will help you with this. 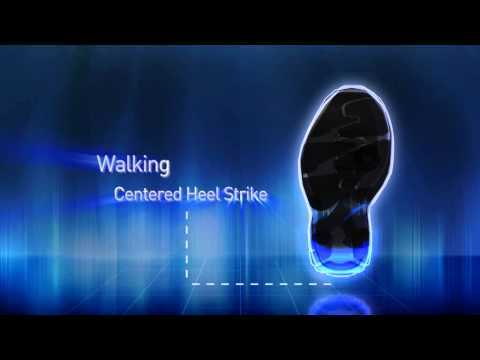 The most important consideration is to identify comfortable walking shoes that fit correctly. If you go on long walks with poorly fitting shoes it will lead to blisters, callouses, general discomfort and may even result in tendon damage. Read on if you want to learn more about how to choose best walking shoes for men. The first point is to ensure that you are looking at shoes designed to let you walk comfortably and choose those that are appropriate to the anatomy of your foot. To do this you need to identify your foot pronation and arch-type and choose the appropriate shoe design. The information below will help you with this. When choosing a walking shoe, first consider pronation. Just after your foot lands on the ground, it rolls inward. This is a natural movement which helps the lower leg absorb shock at the initial moment of contact. This movement is called pronation and needs to be considered when choosing walking shoes. If there is just slight inward movement at the initial moment of contact, pronation is said to be neutral. Under-pronation is when the inward roll is limited and over pronation is when this rolling is excessive. Neutral pronation is the ideal motion to reduce the likelihood of injury. The design of walking shoes takes these variations into account by providing different degrees of support based on the nature of pronation. The maximum amount of support and cushioning is required for over-pronators (massive inward movement) whereas softer, more flexible walking shoes would be appropriate for under-pronators which allows for the little pronation they have to be allowed to take place. What's my foot pronation level? Take a shoe from yours (doesn't matter if it's an athletic or casual shoe) and examine the wear pattern. If the inside is more worn than outside: You might be an overpronator. Outside more worn than inside: You might be a supinator. Same wear pattern on both side: You are neutral / normal pronating. You can also look at your own foot prints. Wet your foot and stand on sheet of paper. The nature of the footprints reveals whether you are a neutral, over, or under –pronating. If you compare the footprints from when you are standing to when you are sitting and the standing (weight-bearing) footprint has a larger surface area than the non-weight bearing (seated) footprint then there is probably a need for some support in your walking shoes for pronation control. Generally, more pronation occurs where the foot arch is lower. The pronation is generally less when the arch is higher. You can find out about your arch type by examining your footprints. If most of your foot is visible, this indicates flat arches. A limited print indicates high arches. It is important to choose a walking shoe with appropriate support for your arch height. Note: Men are heavier than women. Therefore walking sneakers for men need more cushioning than womens shoes. Walking shoes for high arches should have extra padding and arch support that does not limit motion to ensure shock is absorbed and the arch supported. For male walkers with flat arches, firm midsoles and pronation control are required (flat feet can cause muscle stress in feet and knee﻿s﻿). Neutral arches provide adequate shock absorbance and support and therefore do not require specific features in the walking shoe. The pressure and stress that can potentially be experienced by over-pronation is reduced by choosing motion control shoes. These have denser soles and slightly thicker heels. Although they appear a little heavier, they are very durable and protect the walker from pressure at the initial moment of contact. Stability shoes are available for walkers who over-pronate just slightly. These have a thinner heal and are lighter. For those walkers with neutral-pronation, cushioned walking shoes are available. These have limited support making them ﻿﻿lightweight and flexible. Walking and running place different demands on your feet and therefore require different types of shoes. The base of support on walking shoes is on the heel whereas the support for running shoes is more widely distributed. This is because the weight of your body is distributed more evenly on the foot during walking compared to running. During running, there are times when neither foot is on the ground and then, at maximum impact, the foot needs to support 2-3x the body weight. The outer heal absorbs most of the initial impact which is subsequently distributed through the foot. Walking is much gentler. The weight rolls from the heal to the toe on each footfall and shock absorbed is much less (1-2x the body weight) than when running. As a consequence, walking shoes are flexible to allow motion through the roll of the forefoot with greater arch support compared to running shoes. If you are looking at a hiking boot then you will notice the soles are less flexible to provide more protection on uneven surfaces. A high quality pair of walking shoes should last you at least 400 miles, so pay attention to durability as well for the best bang for your buck. As the heel is the maximum point of impact when running, this is the most cushioned area in running shoes. As more heat is generated when running, these shoes are lighter and constructed of materials that cool more quickly. Your shoes are one of the most important considerations when buying your walking kit. It is important to take time and care deciding on a pair that is suitable for your feet. When choosing the best walking shoes for men you need to identify your pronation and arch type and ensure you select the shoe design appropriate for your foot-type. It is best to try shoes at the end of the day after you have been walking so your feet are slightly swollen. Wear your walking socks and take your time to select well fitting, waterproof and breathable walking shoes. Your walking shoes may provide up to 500 miles of service. It is important to choose correctly fitting comfortable shoes to protect your feet and legs and to enhance the enjoyment of your walking experiences. What are good walking shoes for concrete?